As I observe all the cool ways artists are using stencils, I find that most applications are paint based. 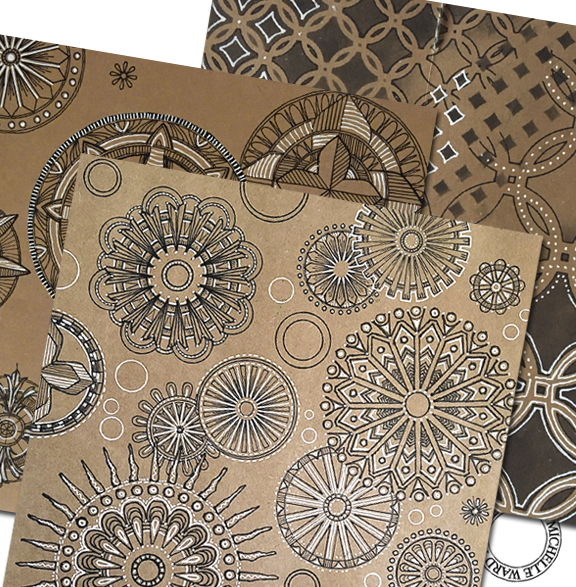 Stencils are such amazing tools to assist us in getting marks on paper. 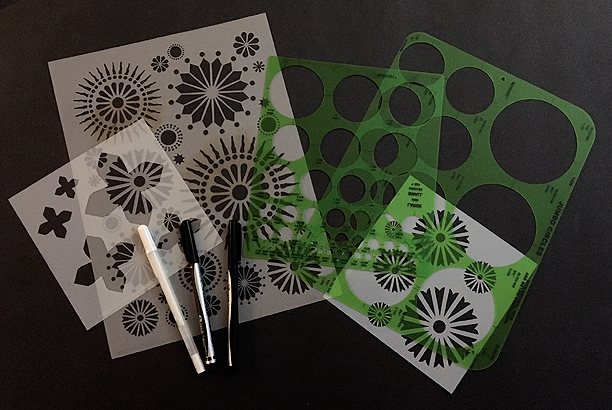 I think one of the hidden secrets of a stencil is to use it as a template, to rely on the pattern openings to draw lines, tracing the perimeter. 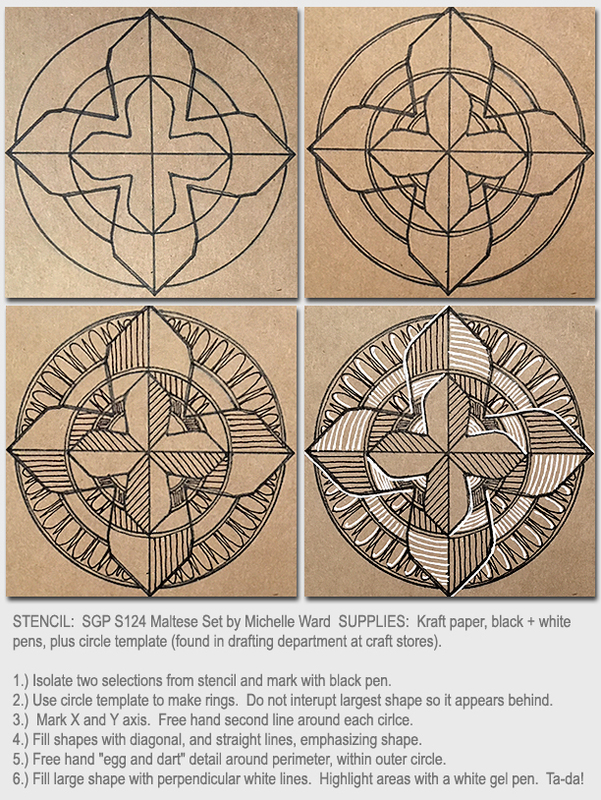 Think about the stencils you have – wouldn’t they be terrific to help you get started on a sketch or line composition? Whether you regard time spent drawing as deliberate, concentrated, and mindful, or you consider drawing to be carefree, relaxed, and mindless, it’s a fulfilling process to enjoy. Committing pen on paper can be intimidating but it has many rewards. The samples I’m about to show you began swift and easy, by depending on stencils to lay the groundwork. The trick to successful composition is to keep at it. Don’t let little wobbles in the line bother you because the more marks you continue to add, the more interesting it will become and the imperfections you worried about will become less noticeable. The ultimate goal is not precision, because that would look machine-made. Evidence of the artist’s hand at work adds to the charm and overall interest. Once you’ve committed to the black lines, the fun part begins with highlights of white. You’ll see the elements come to life as soon as you change over to the white pen. TIP: If you're timid about committing black lines to enhance the design, test with pencil first. THE FUN PART: The more marks you make, any bobble becomes less noticeable, and then the step of adding white highlights will elevate the overall composition. 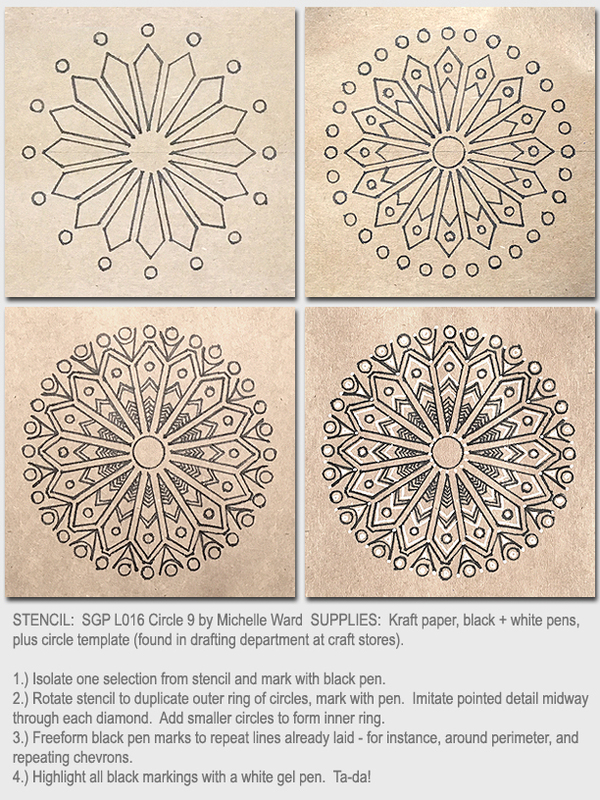 Find all Michelle Ward's stencils HERE! Love this so much! How clever and imaginative - and so beautiful! These are so beautiful! I'm going to have to take a different look at my stencils now! 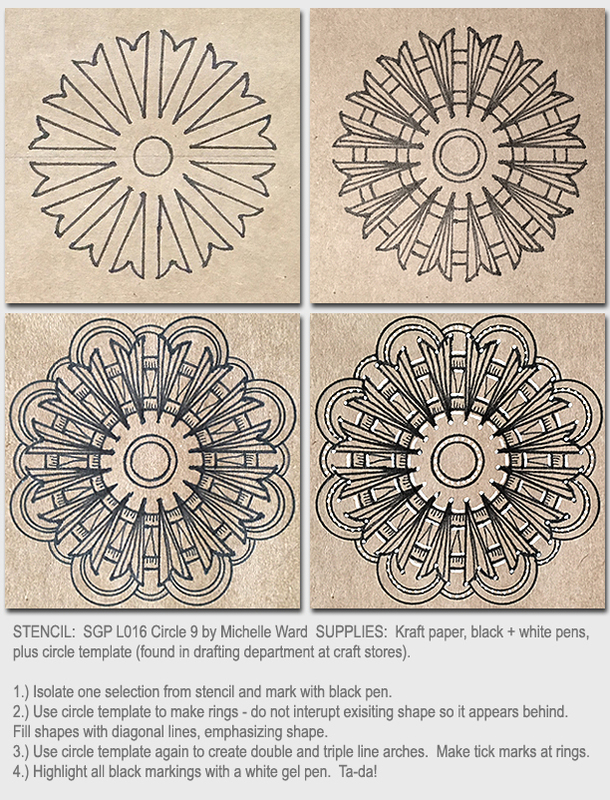 Carrie - a new perspective on your stencils - exactly what I hoped for! Love the work on the craft paper! Thank you so much for the inspiration. I have your stencil and I am ready to play. Thanks Suzie - have fun! 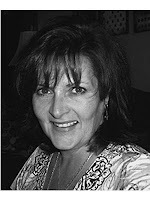 Michelle, I love this! So many possibilities. My mind went a little trippy and thought of zentangling in the spaces. Hmmmm...and the wheels turn. Always ❤ your art! These designs have always been a favorite of mine since the first moment Michelle posted them. 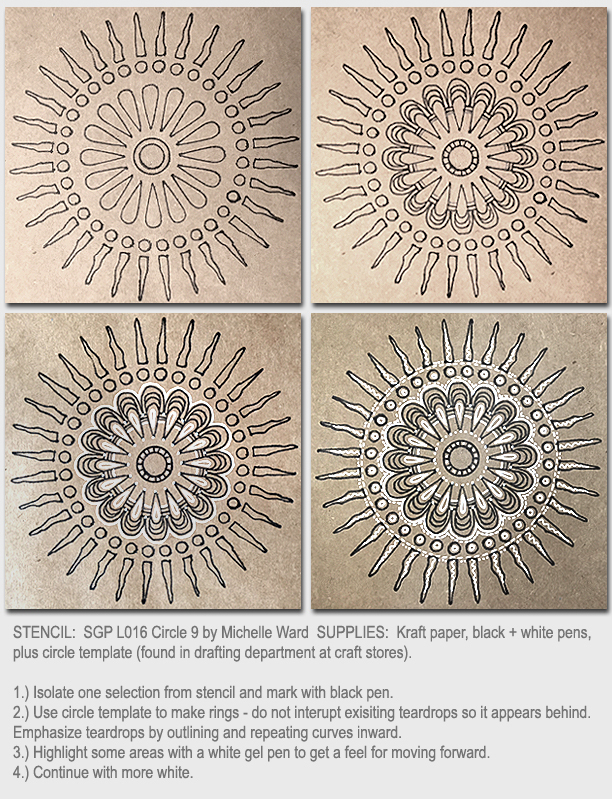 What a treat to have Michelle show us the process with her customary encouragement and her meticulous attention to detail with this awesome tutorial.